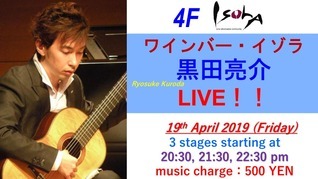 - Guitarist "Ryosuke Kuroda" Live! ・Booking： No need in advance but clicking attend button with a short message is appreciated. Our 4th music collaboration features "Ryosuke Kuroda", leading guitarist in a contemporary music scene in Japan. 'Ryosuke' passionately plays with subtlety & flexibility, interpreting diverse universe of music ranging from classical through pop. With a glass of exquisite wine in your hand, enjoy your own wine time with inspiring music at ISOLA. We look forward to welcoming you all with fine wine, music and art. ・Participated in Weikersheim International Music Festival and attended master classes of Oscar Alberto Ghiglia, Tadashi Sasaki, Roberto Aussel, T. M. Pering, H. Huppert. ・Took part in Ottweiler Gitarren Seminar and had lectures by S. Ienzel, S. Treckel and Takashi Ochi. ・Graduated from graduate school of "Senzoku Gakuen College of Music" in March 2013. Currently performing as a guitarist in Kanto area whilst teaching guitar to bring up young people at "Kuroda Guitar School" that he himself set up. Copyright © Wine-Link All Rights Reserved.